When multiple cats in a household establish a social order, sometimes someone scarfs others' food at mealtime. The losers may get insufficient nutrition, the snatchers too much. If your cats' diets differ -- say, one has food allergies -- ensuring one cat's not eating another's food is crucial. Some people who feed their cats dry food leave ration out all day. This feeding method is called free-feeding or free choice. If you free-feed your cats, stop. Most cat parents who do not free-feed feed their cats twice a day, such as every morning and every evening. How much food each cat needs is determined by his age, weight and health. Follow food package directions as a guideline; consult your vet regarding every dietary decision you're making for your pets. The best way to keep cats from eating each other's food is to feed them separately. The best way to do this is to feed each cat in a different room with a door. If you have both adult cats and kittens or elderly cats, you can feed the adults in an elevated place that the kittens or seniors cannot reach. You can also try feeding your cats one at a time. If you cannot feed each cat in a different room, you will need to monitor them at mealtimes. According to the petMD website, you should feed them as far apart physically as possible, and be present to watch them while they eat. If one cat finishes eating and leaves food in the bowl, pick it up and put it where none of the cats can get to it. Keep in mind that this applies to only food and not to water. Fresh water should be available at all times. If your cats are rotten about others using their water bowls, you may find that a cat fountain solves the problem. Love Meow: Why Does My Kitten Eat Adult Food? 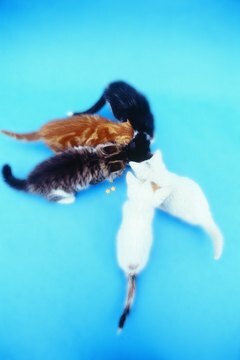 When Do Kittens Start Eating Solids?